Sea kayaking Orcas Cove and flightseeing the Misty Fjords National Monument are two of Ketchikan’s best tours. Our 4 - 5 hour private tour allows you to make the most of your time in port by combining the 2 tours in one. It is the ultimate Alaskan adventure! Please complete the request form below or call us at 1-800-287-1607. We’ll check availability, set up a time that works for your group and create an online booking link for you. Please enter your email address. We'll just use it to contact you with tour availability. We will never send spam or sell your email address. Please let us know the date (or dates) that you will be in Ketchikan and able to take the tour. Please let us know which ship you are traveling on, or if known where you are staying in Ketchikan. Thank you! We'll check availability and get back to you very soon. Our floatplane partners are small, local companies with experienced Alaskan Pilots. Where but Southeast Alaska can you be picked up by floatplane from a boat? Great views from the plane on the flight to Misty Fjords. Flying past 3000 foot peaks shrouded in misty is a truly Alaskan experience. Misty Fjords is one of Alaska's most beautiful wilderness areas. a 230 foot tall basalt column rises in the middle of the Behm Canal. 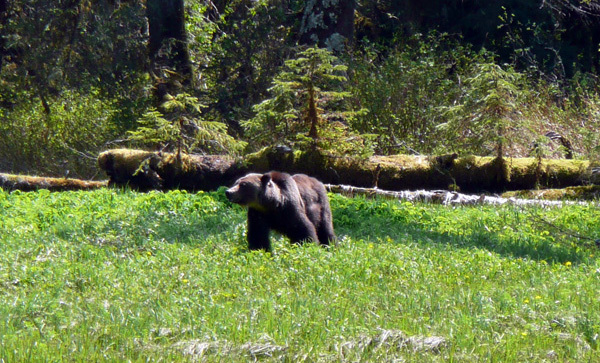 We may see bears along the shore line or mountain goats on the peaks. The granite cliffs are Misty Fjords most distinctive feature. The floatplane lands in town close to the cruise ship dock and Ketchikan's shopping district. Float-plane arrives at Orcas Cove to fly guests to the Misty Fjords National Monument. Meet your guides right on the cruise ship dock and take a short walk to our floating office to get outfitted for kayaking at Orcas Cove. Cruise by small boat to Orcas Cove passing the famous Saxman Totem Pole Park and Mountain Point fishing grounds. Keep an eye out for marine wildlife on the boat journey: Nichols Passage and Mountain Point are hotspots for humpback whales and resident orca pods. Our small boat brings you to mothership Sea Spree where you will meet your guides and become familiar with kayaking. After a quick lesson we take off paddling among rainforest islands, alongside tidal cliffs and into salmon streams always keeping a lookout for wildlife. While it is impossible to predict what we will see on any given day, we often have the opportunity to observe nesting bald eagles or see playful harbor seals and we are always on the lookout for whales. The true highlight of Orcas Cove is the serenity of kayaking in Alaska’s wilderness: the quiet dip of paddles; the sounds of birds singing in the old growth forest and water running over rocks; the salty smell of low tide. We return to the mother-ship for a picnic of local caught and smoked salmon and hot drinks before taking off on the next part of your adventure. Our total active kayaking time is about 1 hour 45 minutes. Previous kayaking experience is not necessary to enjoy Orcas Cove sea kayaking and many of our guests are first time kayakers. All you need is an average level of physical fitness and spirit of adventure. Previous kayaking experience is not necessary to enjoy Orcas Cove sea kayaking and many of our guests are first time kayakers. All you need is an average level of physical fitness and spirit of adventure. Where but Southeast Alaska could you be picked up from a boat by a seaplane? An experienced Alaskan bush pilot helps you aboard the float-plane and takes off for the next leg of your adventure. Our flights are operated by small, local float-plane companies with experienced pilots and impeccable safety records. In the seaplane, everyone has headsets so you can talk with your pilot as you fly to Misty Fjords National Monument. A true wilderness with no roads or towns, the Misty Fjords National Monument is about the same size as the state of Connecticut. Viewed from the air, the 3000 foot granite cliffs and waterfalls of Misty Fjords are an incredible sight. As you fly over Alpine lakes and old growth forest, keep an eye out for mountain goats and both black and brown bears on the ground. An exhilarating part of the trip is landing in the Misty Fjords and stepping out onto the floats to take photos and enjoy the extraordinary serenity of the Fjords. There are great views of Ketchikan and the surrounding islands on the way back to town. Upon arriving back in town, the seaplane company van will drop you back at the cruise ship dock (about a 3 - 5 minute ride). The boat ride to Orcas Cove is about 20 minutes followed by 1.75 - 2 hours of sea kayaking and a snack of smoked salmon aboard the mothership. The flight portion of the trip is approximately 1.5 hours with an additional 15 minutes allowed at the end of the tour for transportation back to the cruise ship dock.